I know where the idea came from. I know when it happened, where I was, and I can even tell you why. It was born on a Sunday, on a flat long stretch of highway crossing the southern Utah desert. I was returning from a road trip with my father and it was during one of the extended periods of silence where a driver’s mind wanders its own depths that I decided I needed a new adventure. I had achieved many of my hunting goals, and I knew that the loftier ones were at the mercy of a state lottery draw for coveted moose, sheep and goat licenses. To say the least, these dreams were many years in the future. I had always been interested in mountain lions, as they held a special mythological place in my hunter's brain. Short of a few fleeting glimpses of them in the woods, I did not have much experience with the big kitties. I could not even tell you the difference between a canine track and the spoor of a puma. I had once been stalked by a cougar several years prior while bow hunting elk, but it wasn't until I seriously started researching the animal that I realize just how close the lion had been. Those strange whistles I heard were not some weird species of bird unknown to me. As I pondered the prospects of taking up mountain lion hunting, it quickly grew to a solid determination to make 2012 the year I started on this new journey to become a lion hunter. 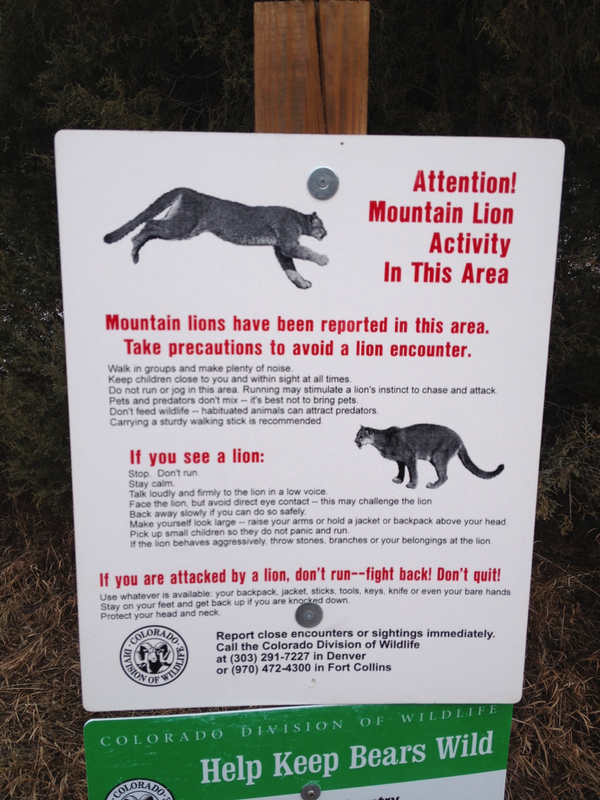 Upon my return from the road trip, I learned that 2012 Colorado Mountain Lion season was due to begin in three weeks’ time. I immediately started a flurry of activating learning all that I could about surrounding public lands and my quarry in general. I annoyed several local game wardens with telephone calls, and at times repeated polite voice mail messages to garner a phone interview. I believe one of them felt I was a little on the insane side. When I asked if he had ever checked in lion killed by calling, his statement was something of the tone of, "it can be done, but it is very rare". All of the wardens suggested finding a hunter with hounds or utilizing a guide service. The prospect of shooting a lion treed by hounds that were not mine and that I did not train, did not appeal to me. I have nothing against hounds men, it just did not seem my way. I visited a national forest office; older, experienced hunters who knew the area I would be hunting; and spoke with nearly anyone who would talk to me about where lions had been spotted or were believed to be. I furthered my research on the internet and found several forums and websites detailing some hunters experience lion calling. I read nearly everything I could get my hands on that discussed the Mountain Lion, his habits, and known behaviors. I quickly learned that the mountain lion is a low density predator that is tough to predict, and can have a very large home range. The best advice I was given was, "find the mule deer, where they winter range, the lions will be." A sign found at the foot of one of the trailheads. My first hunt started on a November 19, 2012, and was spent in an area I had specifically seen a lion in several years prior. Despite several call stands and a hike along a ridge line, no lion was seen/heard or otherwise detected, apart from some very old possible prey kill sites. I had expected this; I knew I was in for a long haul, possibly even several seasons’ worth of calling/hiking/scouting before I was able to connect with a Puma. What I got out of this first day? I caught the bug. There is nothing like setting up a call stand specifically for lions and calling directly for them. I ventured out again the next week, this time spotting my very first confirmed lion track. I spent nearly an hour examining it and trying to track the beast across a sandy drainage, but without snow it was hopeless. I set up a call stand and had an animal spook from a rock scree that was behind me. To this day I do not know if it was a lion, but I like to think so, as some hounds men took a lion out of that same drainage the following day. December 03, 2012 was a game changing day. With a hunting partner I spent the day hiking and scouting an area that I had received a tip on. Several lions had been caught repeatedly on trail cameras in an area known for heavy hiking activity. After the 2.5 mile climb into the area, we set up a stand in the area of the trail cams and started calling. After about 15 minutes of rabbit distress, I let out a lion whistle. Instantaneously a lion whistled back several times and then growled at me from a distance of about 100 yards. Despite another hour of calling, the lion never revealed itself, or he did and I did not see him. I learned many things from this call stand and applied the very technical, “would have, could have, should have" principal to it countless times in my mind. Despite never seeing the lion I counted it as a huge success in a my lion calling career.